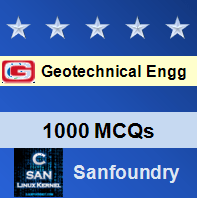 This set of Geotechnical Engineering Multiple Choice Questions & Answers (MCQs) focuses on “Protective Filters”. Explanation: In protective filter, each subsequent layer becomes increasingly coarser than the previous one, and hence, it is also called a reverse filter or inverted filter. Explanation: The soil to be protected i.e., the embankment or foundation material surrounding the filter is known as the base materials. 3. The requirements to be satisfied by a filter material were devised by which of the following organization? Explanation: United States Bureau of Reclamation set four main requirements to be satisfied by a filter material for it to be considered as a protective filter. Explanation: A protective filter designed in such a manner as to provide quick drainage, yet prevent the movement of soil particles. 5. What type of filter is provided at the bottom of drainage sumps and trenches? Explanation: Weighting filters at the bottom of drainage sumps and trenches arrest the percolating water at the exit and allow its safe exit without inducing piping. Explanation: With a proper drainage filter under slope or rock fill toe, the phreatic line in an earth dam can be kept well within the body of the dam. Explanation: The D15 size of filter material must not be more than 4 to 5 times D85 size of the base materials. This prevents the foundation materials from passing through the pores of the filter material. Explanation: As per the criteria given by Terzaghi, the grain size curve of the material should be roughly parallel to that of the base materials. 9. The filter material should be ___________ enough to prevent buildup of seepage forces within the filter. Explanation: The filter material should be sufficiently coarse and pervious so that the incoming force is rapidly removed without any appreciable buildup of seepage forces within the filter. Explanation: A protective filter consists of a combination of layers of pervious materials to provide quick drainage.